Horrendous. That was the word running through my head throughout most of Confessions of a Shopaholic. Now, I fully understand that I am not the demographic for this film, but even the ladies out there should be able to see how shallow and unfulfilling this dismal trainwreck turned out to be. Shopaholic almost turned me into an alcoholic because that was the only way I could see myself escaping with my sanity intact. 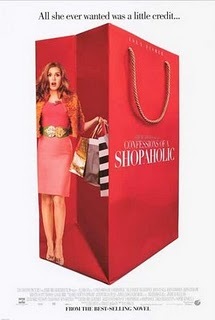 Confessions of a Shopaholic follows Rebecca (Isla Fisher) who just loooovvvees buying clothes because, like, they're so, like, fashionable! Tee hee! Too bad she's just been canned, is in complete debt and is on the fast track to living in a van down by the river. But as movie luck would have it, she is hired by a financial magazine thanks to her brilliant way of metaphorically tying numbers and clothes together. Like I said, brilliant. Then she meets this guy and, well, you know what happens from here. Is this movie supposed to be funny? I hesitate to call it a comedy because I only chuckled once or twice (maybe). Of course, I also chuckle at Dora the Explorer occasionally, so what the hell do I know? This film was so unfunny you could have heard crickets chirping in the theater. Rarely did I hear everybody laugh. However, that could be due to the atrocious dialogue. While the movie certainly isn't a prize winner, you would think something as simple as creating mildly decent dialogue wouldn't be too taxing on the writers. But you'd think wrong. The film's dialogue had me unintentionally laughing or rolling my eyes more times than I can count. There had to be at least a dozen groan inducing lines in this travesty. But here's the worst part. All this film does is buy into the consumerism stereotype and the idea that no woman anywhere can be happy without a Prada bag and cashmere sweater. I haven't seen a film with such rampant disrespect for women in years. Every single female that appears in this film, which numbers in the dozens, is a shopaholic and obsessed with clothes and shoes. Their personality traits are tied only to what they're wearing and frankly, I found it disgusting. There isn't one strong, independent female in this entire film. The only good thing about the movie is that the performances by the cast were uniformly good. On the whole, I really can't complain. Isla Fisher is adorably cute as usual and elevated this bottom-of-the-barrel material above and beyond what it would have accomplished with a different lead. With that said, so...freaking...what? Strong performances don't mean jack when you have such a dismal story accompanied by dreadful dialogue and a shallow representation of women. Females everywhere would be doing a disservice to themselves to plop down their hard earned cash and tell Hollywood that this is what they want to see. I implore you, don't give into this appalling illustration of the female mindset and skip Confessions of a Shopaholic.